Additional mastering at Injection Studio. The copyright in this sound recording is owned by Injection Records and is exclusively licensed to Internal Records. Q1: Recorded live at The Warehouse, Cologne. I first heard at a free party just outside Stratford in 1993. Every week 1993-95 as a closure signature track, this was played at Goldiggers in Chippenham. It became anthemic at this venue! Around 1994 I owned an Amiga 500. I had many diskettes with games but also about 10 diskettes with house music and quick moving computer images, VJ like material. One of those diskettes was with this song from Rob Acid, I found out later. So I don't know if this diskette was made by some guy or made by Rob Acid himself. Compared to mr. Babicz's work under pseudonyms like "Colone" these record is different from his other masterpieces like "Acid science trax" vol. 1 and 2 on Labworks. 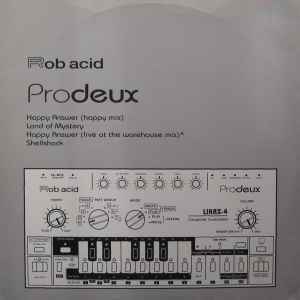 Tracks on "Pro Deux" were originally released on Injection Records, Germany. All 4 tracks are straight-forward honest and happy 303/909 stompers that are quaranteed to make you move. To some they might sound naive but for me they still work and send cold-chillin shivers thru my spine every time i listen. A must for any 303 freak or Rob Acid collector.